Visit your admin panel (if you're not sure how to access this, please email us at support@topperoo.com). Choose the relevant template, and then add your text / photos. If you are wanting your customers to change a word or number in the design (eg their age / name), try and make it as easy as possible for them by highlighting the relevant area to edit eg "Happy [age] birthday, [name]!" Refresh the page and then go to the pre-made designs tab to see your created designs. 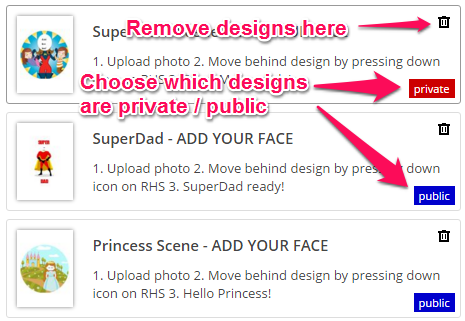 Finally, toggle the design to 'public' to make the design live for your customers.